I love rhubarb and every spring look for new ways to use it. Rhubarb pies, tarts and crisps are a standard part of my repertoire. 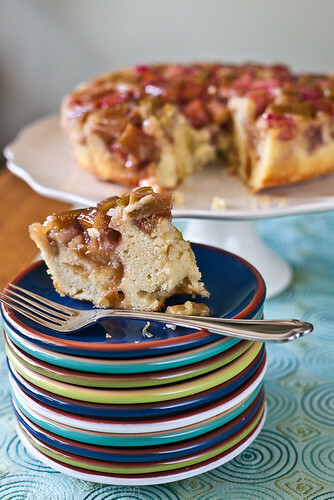 I use simple rhubarb sauce in many ways. I’m more often seeing rhubarb appear on restaurant menus as a foil for savory or rich dishes, often paired with braised meats, for instance. Still, when you have a lot of it, it seems best to incorporate into a dessert of some sort. 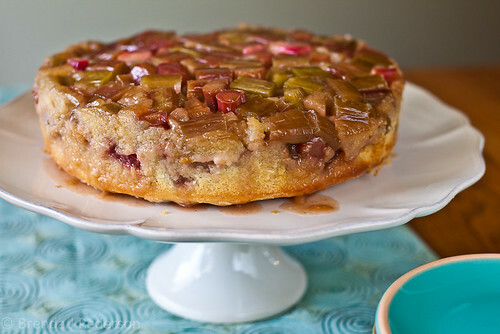 When the New York Times ran a recipe for Rhubarb Upside Down Cake it immediately became one of my “to try” recipes. I made the cake this weekend and while it was good, it was not as good as I hoped. I’ve tried to put my finger on exactly what wasn’t quite right and it seems to boil down to personal preference. The rhubarb doesn’t take enough of a lead role in this dessert. It’s more of a contrast to the cake instead of the primary taste. So there’s nothing wrong with this recipe but I probably wouldn’t make it again. I still prefer my old standard, Grace’s Rhubarb Cake. If you make this recipe I have two small notes for you. I baked the cake for ten minutes longer than the recipe specifies and the center of the cake was still a little soggy. It might need another five minutes, although the outer portions of the cake might be a little too dry then. Also, this recipe can easily feed 10-12, not 8 as specified. you are so coming to the next rhubarb fest. Oh…. I’d be deelighted to! Oh, if only I could get my family to eat rhubarb! This looks sooo tasty!